Yet another fantastic development week here in London. Many fantastic achievements for lots of different reasons. Unfortunately not all of our experiences this time round where positive. Disability discrimination still exists in our society. We are not going to highlight this here but will review later so you can read about “How Disability discrimination has such a large effect on the client”. Swimming this week took place in many facilities and once again we thank all of the staff who make these weeks possible. Without your kindness and sometimes lenience our development weeks would not be a reality. Through paediatric disability consulting we constantly have to “think outside the box” and this week was no different. Mr J, Mr H, Mr T, Miss M and Miss F are a few of our highlighted swimmers from the week. Mr H, one of our initial development week clients is now swimming unaided with 3 competitive strokes. His training this week consisted of dry land and water exercises including stroke development for freestyle. Meeting with his swimming teacher Vanessa who made an additional trip during her busy weekend to join us and also hydro sessions with Wendy and myself. Swimming in Reeds school gives us fantastic scope to work with Mr H who is now able to swim freestyle in 45seconds for 25m that also being without his comfort wetsuit giving added buoyancy! At the age of 7 he is already learning the key skills for competitive swimming and taking part in development galas picking up lots of medals! He already has the GBR talent squad eyeing him up but note Mr H is a Swim Lab Lanzarote swimmer! Developments this week included: fantastic core stability work, lengthening out the core and driving through the stroke feeling the propulsion! This isn’t all, Mr H managed to start swimming Butterfly, yes that right – initially getting DQ´d by myself (Harsh you may say) this was the one and only time the arms stayed under the water on recovery so it clearly worked! Following talent spotting guidelines we are developing Mr H with not only FRS and BKS, Fly is now in the mix: Keep up the great work and we cannot wait to see you in May my little super man. Mr T, what can we say! A newbie to Swim Lab Lanzarote but what a fantastic effort and development week he had. Combining both hydro and pool based exercises we have now developed a much stronger core, resulting in a more upright position being seen in his posture but not just in the water. Mr T takes part in a Disability Football group at dare we say it Chelsea Football Club training ground and his coaches and parents noticed a huge difference in his gait along with not falling over on the pitch which is a normal occurrence for Mr T. (I think it was practise for fake fouling in the future, only joking!). We worked in the water on all 4 competitive strokes which all showed a noticeable improvement through the week. Part of this journey is to make sure everyone is on the same page and combining the necessary skills to assist in the development of the client. There are some great coaches around who maybe just need a little assistance in getting the “outside the box approached sorted”. Mr T had me awake until all hours because he demonstrated breast stroke in a way I was really not expecting. I have already noted this on Facebook through the week but I will say it again “Mr T and breaststroke is one to watch in the future”. The green rings by “Smovey” as with most of our development sessions made an appearance to assist with our stability work. Mr T will be incorporating these into his land based programmes with his personal trainer/s&c coach. Key factors for Mr T this week included a stronger squeeze and lift approach in all strokes and pretending to be a puppet with strings to hold us nice and tall! Mr T, keep up the great work and we look forward to see you in May with some S&C work to really help you improve. We have already seen what you are achieving in a week, what are the next few months going to have in store? Mr J, our week didn’t quite go as planned for you this time round. However, the sessions that we did manage to have you showed how much you had remembered from last time round. Being in the water for Mr J is a great experience and gives his body the time to loosen up and release the pressure from day to day life. We worked on floating and rotation both of which showed improvements from November. Your carer Duncan has been working really hard with you to try to remember how to stay nice and tall. Our karate is improving which have allowed you to be able show 5 complete arm strokes using karate chops with face down in the water. Unfortunately we only managed to get in the water 2 times during the development week no thanks to Tandridge Trust community pool in Oxted which is clearly not for the community. Mr J, thank you for the effort you put in this week and i look forward to helping you again very soon with a more considerate support network. Miss M, no matter what is thrown at you, you and your family battle through unbelievably. Miss M has had sessions in Lanzarote in our resident camp along with sessions in London. 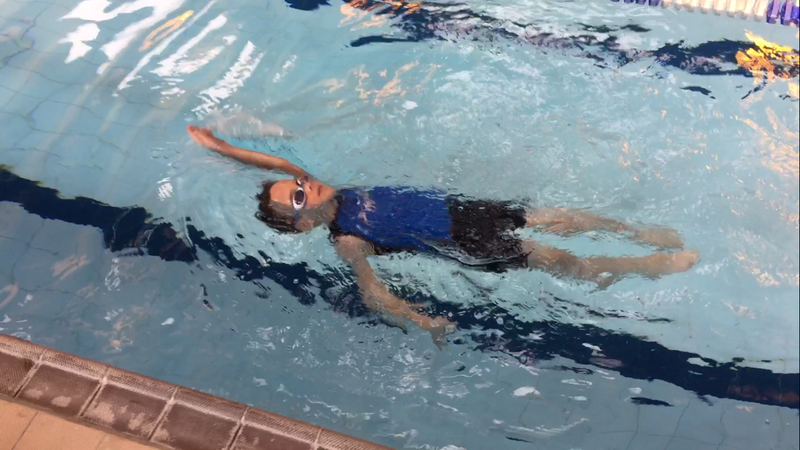 This week we had the chance to work on some new skills and start to develop back stroke. Miss M sometimes has additional battles with the water but we always get through and make fantastic improvements as you can see in the video. Going out of our depth and swimming in the deep end of the pool always a pleasure to work with and we will be seeing you very soon with your sister over in Lanzarote for a whole action packed week of development. Miss F, despite energy levels being fairly low this week we managed to achieve 25metres swimming front crawl all on our own without any support. At the beginning of the week it didn’t look like we would be able to achieve this but in true form we worked our magic together and produced wonders. Both Mum and Dad where able to watch as she continued to push through the length of the pool. Now we are able to do this, I think Lanzarote sunshine is waiting for you to build on these new skills and help you to progress. See you soon Miss F, I will have the rubber ring and floating seat ready for your brother too. In conclusion, as you see above these weeks mean a great deal to the clients their development is evident and not something we can do every week of the year. These short but condensed sessions help to enhance the skills and work with consultants to build a programme to work with in between times. They are not “swimming lessons that you can get anywhere, in fact we even train teachers and coaches to work specifically with people with additional needs. You can find out more about our teachers/coaches training academy here. As always we end by thanking the clients, carers, parents, friends and families who make these weeks possible without your support the service we provide would not happen. A special mention to all the pools that allow these children to develop. We look forward to seeing you again in May!